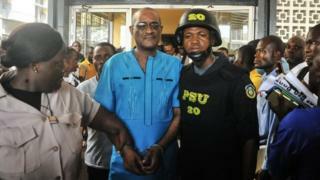 The son of Liberia's ex-President Ellen Johnson Sirleaf has been charged with economic sabotage in connection with the unlawful printing of local currency worth millions of dollars. Charles Sirleaf, a deputy governor of Liberia's Central Bank, is suspected of pocketing some of the proceeds in 2016-18. Four other ex-bank officials were also charged. Two of them are on the run. The accused have so far made no comments on the allegations. An independent report into the missing millions was released last week. One of the world's poorest nations, Liberia has been struggling with rampant corruption. Ellen Johnson Sirleaf, president of the West African country from 2006 to 2018, was credited with bringing economic stability after years of conflict. On Monday, Mr Sirleaf, former bank chief Milton Weeks and bank official Dorbor Hagba were charged with economic sabotage, misuse of public money and criminal conspiracy. A judge in the capital, Monrovia, ordered them to be held in prison until a bail hearing. Lawyers for the accused have not responded to the allegations. The other two defendants still at large were named as Richard Walker and Joseph Dennis. The much-anticipated report was carried out by investigative auditing firm Kroll. It was looking into the alleged disappearance of more than $100m (£75m) worth of newly printed Liberian banknotes last year. It had been widely reported that shipping containers full of banknotes had vanished from Monrovia's port and airport. However, the report did not find any proof that this happened. Instead, it found that Liberia's Central Bank had acted unilaterally and unlawfully by printing and importing into the country three times the amount of banknotes it had been authorised to do.